How do I render in 4K in MMD? What settings should I use when rendering in 4K in MikuMikuDance? What are the hardware requirements to render in 4K? Hey readers of LearnMMD it is parkeerwacht again! I haven’t posted on the site in a bit because I haven’t had much time to spend on MMD these past few months. YouTube supports 4k video in 60FPS! So, to be able to render at these resolutions, you must have a decent computer. Don’t worry, even my system isn’t as good as the recommended list so take this with a grain of salt. I chose those lists because if using slower hardware the render will take ages! Another reason to have good hardware is to prevent your complete system from hanging due to the load. If you have any other recommendation please inform me in the comments! Last time we used Ut Video to render. As good as this codec is, we are not going to use it. I know you may think: “But PW, why did you recommend that codec in the first place?” Well the answer to that is simple, Ut Video works perfectly for HD video, but it has some problems handling 4K into the compression algorithm. This causes some weird bugs, like audio syncing. I will add a note here if it gets fixed in a new version. For now, I have had a lot of success with ffdshow codec. It is lossy, but the decrease in quality isn’t as bad with 4K as it is with 1080p/1440p in my opinion. I use Ut Video to render whenever I can, though, as it’s quality is higher due to it being a lossless codec. However I found with 4K the decrease in quality isn’t really noticeable. Plus I do not have a 4K capable monitor so I don’t have a good way to confirm it though. Too render in 4K you must have your screen size set first, to do this go to the view tab and click screen size. In that window enter Width 3840 and Height 2160, as shown. Now finish your animation and go to File, Render to AVI and select a location to save the AVI. MAKE SURE TO SAVE TO A LOCATION WITH A LOT OF DRIVE SPACE AVAILABLE! 4K VIDEOS USE A LOT OF SPACE! Save it somewhere and then the render window should pop up. For the frame rate use 30FPS to start out with and if that render goes good try 60FPS. Of course select your encoder. 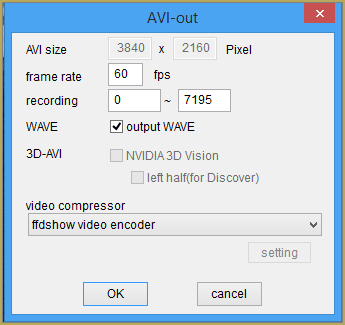 In this case I will use ffdshow encoder, but you can try Ut Video too! Note that rendering 4k video may take hours to complete, I have let this render over night! You could upload the video as it is right now to YT(unless you use Ut Video) But this will take ages to complete that upload. If you transcode it it will be a smaller size while mostly keeping the original quality. 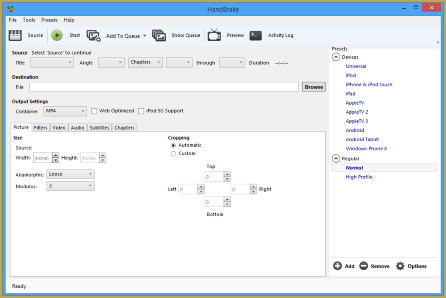 For this I use a program called HandBrake you can download it here. If you used Ut Video to render, you must transcode otherwise YouTube won’t accept it. The steps are quite the same as on my older one but I wanted to inform that there are some different things about how to render 4K. The hardware list may not be accurate but if you have any improvements from your experience, please tell me! I will edit it! If you have any questions please ask in the comments below. I, or one of the other members of the LearnMMD team will try to answer them! any way to render directly as 4k mkv from mmd without any additional software? Is it ok if I use mjpeg compressor since it’s the only one that doesn’t make my MMD crash when trying to save..? This may sound stupid for some people, but I’m new to MMD. Is 30 fps still considered 4k even with the same screen size as said above? Because I have tried 60 fps multiple times but it hangs somewhere before it’s finished. “4K” is solely about image resolution being 3840×2160, regardless of having 30 or 60 frames per second. So yes, it does count. Can you see what video file size your rendering stops at? What file system is your hard drive formatted to? Do you have enough space in it? When I turn off physics calculation in MMD then I have 60 fps. Can someone tell me if I buy better graphic card like gtx 1080 will be fine? 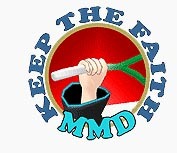 You already HAVE all the right stuff… You are simply over-taxing your system when MMD is running.. I can imagine that you have much computer lag as you work with MMD… but the rendered AVI video should look just fine. My only tip might be: to reduce the visible lag as you animate, you best not apply any effects until you have your animation completed… effects burden your system. … In my ARROW animation, the Spotlight Effect just nailed my system to a standstill. … So I did my animation with no effects in a separate MMD file and I copy/pasted finished segments into my main animation that had the Spotlight effect running. Additionally to Reggie’s answer: since your FPS restores to normal as you turn *physics* off, obviously it’s that (and not graphics) that strains your system in this particular case. Therefore, even if you *did* try your setup on a GTX1080, more likely than not it wouldn’t help you with the main roadblock you have. So your best chance is, if possible, to plan your video with physics turned off, and to turn it on only for actual rendering. You also may somewhat alleviate the workload by figuring which models and stage elements do and which do *not* happen to be in camera’s visor at each particular moment of the video and turning on invisibility for those that are not necessary for a while (and, I suppose, temporarily turning off their physics as well). If you say so then I try rework my stage with 20 person. Hey, they are cheerleaders, right? May I suppose that they actually use the same model and the same dance for all characters? If so, you may consider using Clone effect on one model (or maybe on two or three models, so you get few different motions after all) instead of forcing your CPU to calculate identical physics for each and every one. You may need to edit the effect a bit to make those girls stand in the order you like (read this chain of tutorials for inspiration, from bottom to top), and you better not set it up for *too* many clones, as you will end straining your system anyway, but this might be a pretty worthy alternative. It looks like i am finally back to normal. And i say finally because it took some testing to get it right. I reinstalled Windows 10 version 1703 (build 15063), i deactivated the windows update service. Installed the ffdshow codec version (ffdshow_rev4531_20140628_x64) as i was pretty sure was the one i used back when it worked correctly. And still on MMD v9.26 x64 because that was the version i used when it still worked. But to my surprise, now my 4K videos got even smaller then before. Luckily i had a reference video from before, it was 13.0Gbytes when ffdshow worked. And now the same video was only 4.38Gbytes, and the quality was not the same. It was kind of blocky not your usual the bitrate is to low kind, but it just wasn’t as smooth as the reference video. So testing a lot of different k-lite packs and ffdshow versions, now i finally found one that produces a video file that matches my reference video file. And i can’t tell any visible difference in the 2 videos. And it even has a shortcut for a little config gui for the encoder, so it looks like it’s possible to adjust som settings to this one. Now i wonder if that version will work in the last windows update, but now that i finally got it working, i am hesitant to test it out. After i got the last Windows 10 creator update build 16299 i can’t make 4k video’s using ffdshow anymore. It looks like it is doing a raw save in the video file because it gets to the size of about 41.7Gbytes and the recording hangs everytime at the exact same frame of my video. i tried to lower the resolution but it still hangs at the same spot, then when i close MMD the file is about 41.7Gbytes. I have tried uninstalling ffdshow x64 and downloading it Again and installing, but it’s the same result. I tried the 9.29 version yesterday, and it was the same. I could try the k-lite pack and see if it’s any better. MMD v9.30 x64 can’t see the ffdshow codec in the list when i have the k-lite full pack that should have ffdshow codec in it. There was a update pack for the K-lite full pack, but that still does no’t get ffdshow to show up on the list, even after a restart. I suspect that it’s not the x64 ffdshow codec that is in the k-lite pack. I tried MMD v9.30 32bit, and i can’t see ffdshow codec on the list here either. looks like it was the k-lite mega pack that had ffdshow vfw (video for windows) in it. so i’ll test it again. I give up, it still does not work. I tried the ffdshow standalone codec again in MMD v9.30 x64 still the same, it stops when the file gets to 41.6Gbytes. I did like that i could see the GPU in the taskmanager now. but if i can’t make videos… then what’s the use. Have tried 32 bit version yet? I use 32 bit for codec compatibility and find that there’s no difference in performance, even did a little testing to make sure (although just informal testing, nothing comprehensive). yes 64 and 32bit, mmd and 64 and 32bit codecs tested. the ffdshow codec standalone with mmd v9.30 32bit won’t even start the recording. I’m sorry, you wrote that earlier, and I didn’t read everything. This is a dumb question, but will Gaming PC work for MikuMikuDance? Do you already have a Lamborghini, or you just consider buying it for the sake of MMD? Anyway, as you learn your way around MMD, eventually you will want to apply multiple flashy MME effects to your video… and then, just like it is with games, one day you will discover that there’s no such thing as “overkill PC”. I tried to download ffdshow, but the option doesn’t show up on mmd when I render to avi. I don’t know if I installed ffdshow wrong, but I don’t want to uninstall it just to try again. The ffdshow encoder, is there a newer version ? Apparently yes, that’s the latest. Does it pose a problem? Why do you use such a brutal backward transcoder like the hadbrake? IT has only a few options. Why don’t you use a more moderned like the Hybrid? I use the 64-bit version of MMD. There is no video file “ffdshow video encoder” in the version I use. That’s why I use “DV video encoder”. Do I have a problem with that? Well, to me DV forced the resolution down to 720×480, ignoring settings I chose. So high-def videos (not to speak of 4K) are not available with it. If you don’t have problems with *that*… then you don’t. You can install K-Lite or other codec pack to get ffdshow. 我的會閃退 1s 1fps in 1080p but i change 4k 1s 2fps ? We do not understand your question. … can you state the question more clearly? I followed the guide, but when i uploaded my video to youtube, it is only showing 1080p 60 fps. Any idea how to fix it? Youtube takes some time to process the video even after it’s public. It needs to make independent versions for all the resolutions it thinks people might use, and that takes time. Not sure if that’s the problem, but offered just in case.